If you missed out on the Bitcoin Boom then you’ve probably thought about looking at some of the altcoins. In that case, you’re probably wondering, “what is XRP Ripple” and “What is ETH”? These are a couple of alternatives to Bitcoin that could well be more sustainable and more technically sound – and a good investment for people who are interested in making some money trading. Crypto-currencies come in a few different forms – mineable ‘coins’ and token based networks offer a lot of potential for investors who can make good decisions. When you’re asking What is Ripple you need to understand that Ripple is the name of the currency, and XRP is the name of the token that is used for the payment network. Ripple has risen in value from 0.01cents a little over a year ago, to one dollar at the end of 2017. That’s a huge increase in value. Whether it will continue to gain value is unknown. Whether it serves as a long term store of value is unclear. Ripple differs from other crypto currencies because it has something to offer – it sells its product to banks and to other financial services companies, offering them a way to send and receive international payments, and to settle their international transactions, in a cheaper, faster and more efficient way than other systems. 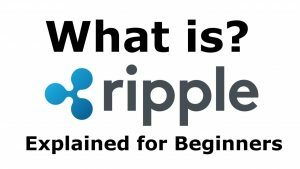 Ripple is a company that offers two services – xCurrent and xRapid. The token used by xRapid is XRP. Those who aren’t intimately familiar with the network tend to refer to the company and the two services as Ripple, but that is not the case. XRP is to Ripple what the bitcoin is to the Bitcoin blockchain. The thing that is important to remember, though, is that there was never any actual intent for XRP to be used as a public currency – the idea was that it would be a service that financial institutions would use. XRP is a settlement token, not a public coin. You cannot mine for Ripple – the only real similarity is that Ripple’s transactions are verified by multiple parties. Ripple owns 60% of the XRP that exist, and the other 40 billion XRP are active and make up the coin’s market cap. The success of Ripple as a functional payment network does not have to rely on the price of the XRP token. XRP has some features that make it superior to Bitcoin – transactions clear more quickly, and the cost per transaction is much cheaper. People are viewing it as an alternative to Bitcoin – and it has made a large number of headlines, attracting a lot of companies – including American Express – as partners. XRP is gaining popularity because it is an established token, and it has a high market capitalization. Today, a new token launches almost every day and it is easy to attract a little attention. Some people are investing in lots of different tokens, some are putting all their money into one. With both strategies, a small amount into Ripple makes sense because it it still an affordable coin but it is gaining value rapidly. This makes it a popular low-cost investment, and one that is unlikely to vanish overnight, because it actually has some big companies backing it. Crypto-currencies are an immature marketplace, and we can expect to see a lot change over the coming months and years. Even Ripple is a gamble – and not something to put your money into without extensive research – but it is a promising bet for a crypto enthusiast.